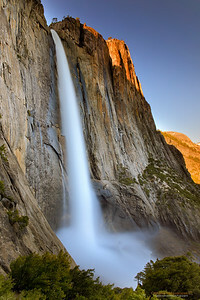 "Evening Light on Bridalveil Falls" Location: Yosemite National Park, California. 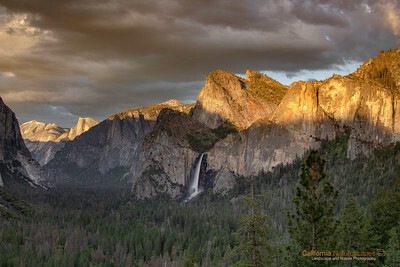 Mid May light of late afternoon falls directly on the walls of Yosemite illuminating them in warm hues. Tech Info: Lens: Canon EF 70-200 f/4L IS @200mm Camera: Canon EOS 5D Mk II Exposure: 1.3sec at f/16 and ISO 200 Filters: Hoya 8-stop solid ND filter to cut light and allow long exposure This is a stich from five horizontal shots to obtain even exposure during changing lighting conditions. Location: Tunnel View, Yosemite National Park, California, Map It is often difficult to do justice to the grandeur of Yosemite in an image. If you have been to Yosemite you will probably recognize this classic view from Tunnel View vista point. Typically on a clear day most of the valley including El Capitan and Half Dome can be seen from this spot. See image in the thumbnail below for a sweeping view of the valley from this location during sunset. So when I arrived here on this foggy day I was greeted with a view I had never seen before. The fog had engulfed most of the valley behind Bridalveil falls. Moreover there were storm clouds behind me with pockets of opening allowing sunlight to pour through on the pine trees. The fog was moving fast but since the valley is several miles deep it gave me just enough time to capture this image and marvel at the grandeur of the valley. Soon after I shot the image the storm clouds got dense and fog also moved forward hiding everything. So here is that transient moment of beauty in the Yosemite valley. Tech Info: Lens: Canon EF 24-70mm f/2.8 @ 70mm Camera: Canon EOS 5D Mk II Exposure: 2min at f/14 and ISO 50 Filters: LEE Big Stopper 10 stop ND filter, LEE 0.6 (2-stop) soft graduated ND filter Yosemite is the arguably the most beautiful national park. It's grandeur and the time scale it took to evolve is very humbling. I learnt that the granite peaks started out as molten magma deep below the earth's surface about 100 million years ago. Merced river then carved it into a "V" shaped valley and finally glaciers shaped it into its present day "U" shape. The beauty of the valley has inspired many. It's lush forests, tall granite peaks, amazing monoliths and beautiful waterfalls are so pristine that a visit to the park often overwhelms the senses. A visit here at least once in lifetime is a must. 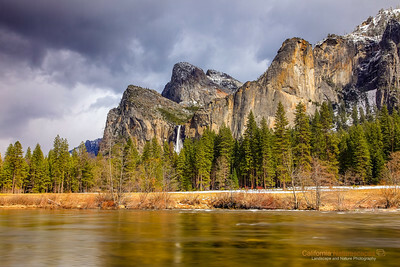 "Bridalveil Falls in Spring" Location: Valley View Visa Point, Yosemite National Park, California. I guess it is great to be in Yosemite at any time of the year and I believe I have been here in each season at least once. But when I witness great lighting conditions in the valley the visit is just that much more memorable. 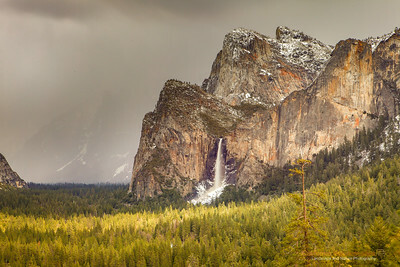 Here is the view of the famous bridalveil falls when dense storm clouds were rolling in with pockets of opening in them. Through these openings late afternoon light momenterily illuminated the falls and created very appealing contasts in the scene. Characteristic of the spring season the waterfall was near it's peak and there is still some snow on the higher elevations. The meadow is just beginning to thaw and will turn lush green in few weeks. However, the storm clouds will be all but gone by that time. Tech Info: Lens: Canon EF 17-40mm f/4L @ 31mm Camera: Canon EOS 5D Mk II Exposure: 1.3sec at f/14 and ISO 50 Filters: Hoya 8 stop solid ND filter to allow long exposure. LEE .6 (2-stop) soft edge graduated ND filter. Yosemite is the arguably the most beautiful national park. It's grandeur and the time scale it took to evolve is very humbling. I learnt that the granite peaks started out as molten magma deep below the earth's surface about 100 million years ago. Merced river then carved it into a "V" shaped valley and finally glaciers shaped it into its present day "U" shape. The beauty of the valley has inspired many. It's lush forests, tall granite peaks, amazing monoliths and beautiful waterfalls are so pristine that a visit to the park often overwhelms the senses. A visit here at least once in lifetime is a must. 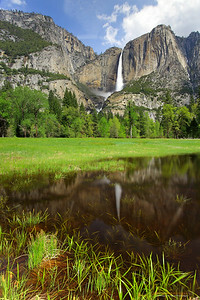 "Yosemite Falls in Spring" Location: Yosemite National Park, California. Spring in Yosemite is beautiful. The waterfalls are at their peak flow, greenary is all around, temperatures are very comfortable and little ponds in the meadows add to the scenary. Tech Info: Lens: Canon EF 17-40mm f/4L @ 23mm Camera: Canon EOS 5D Mk II Exposure: 2sec at f/16 and ISO 50 Filters: Hoya 8 stop solid ND filter to allow 2sec exposure. LEE 0.9 (3-stop) soft edge ND Grad filter to balance exposure of the sky with foreground. "Upper Yosemite Falls and Half Dome" Location: Upper Yosemite Falls Trail, Yosemite National Park, California. 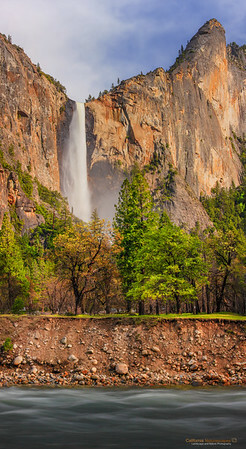 Yosemite falls are so tall that often a direct picture fails to convey that to the viewer. I felt this composition provided more emphasis on the grandeur of these falls especially since the image included view of another Yosemite icon, Half dome. This image was shot half way through the hike on upper Yosemite falls tail. As you start climbing more of the sweeping views of the Yosemite valley can be seen. I hiked all the way up to the top of the falls but realized that the spot from where I shot this image was the best vista point on the entire trail. The view of the falls itself is very captivating but you can also see other prominent features of the valley from here such as iconic Half dome. Tech Info: Lens: Canon EF 24-70mm f/2.8L @ 30mm Camera: Canon EOS 5D Mk II Exposure: 20sec at f/16 and ISO 50 Filters: Hoya 8-stop solid ND filter to cut light and allow long exposure. Two graduated neutral density filters stacked together: LEE 0.9 (3-stop) soft edge and LEE 0.75 hard edge rotated at 2 o'clock position. Yosemite is the arguably the most beautiful national park. It's grandeur and the time scale it took to evolve is very humbling. I learnt that the granite peaks started out as molten magma deep below the earth's surface about 100 million years ago. Merced river then carved it into a "V" shaped valley and finally glaciers shaped it into its present day "U" shape. The beauty of the valley has inspired many. It's lush forests, tall granite peaks, amazing monoliths and beautiful waterfalls are so pristine that a visit to the park often overwhelms the senses. A visit here at least once in lifetime is a must. 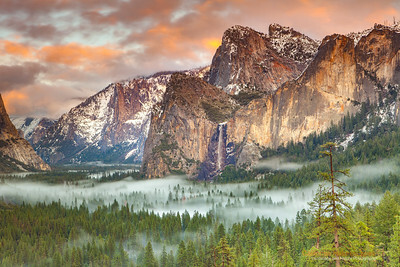 "Valley of Enchantment" Location: Valley View, Yosemite National Park, California. 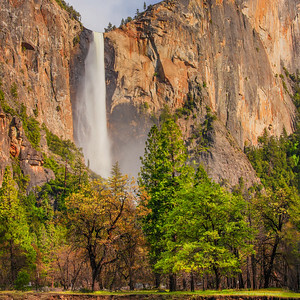 Yosemite is arguably the most beautiful national park in the world. I feel very privileged that I stay close to Yosemite and can visit it anytime with a couple of hours drive. The proximity to the park has allowed me to visit it practically in every season. 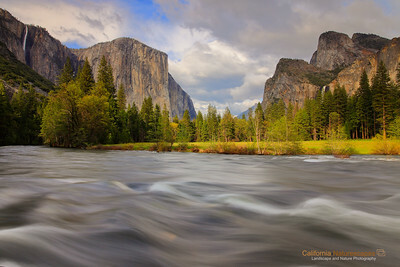 The view captured here is during spring season when the water in the Merced river is high and rapids are in full force. Spring is also the season of waterfalls and you can see that the Bridalveil falls on the right and Ribbontail falls on the left are also flowing at their peak. The waterfalls reach their peak flow due of all the snowmelt at higher elevation. 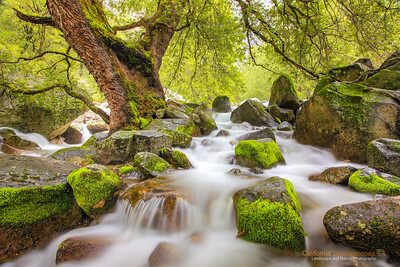 The beauty in the valley does not end with flows in Merced river and waterfalls alone. The meadows start turning green and bring out a lush green color in the park that is in very good contrast with the warm tones of the granite peaks during evening hours. And when all of this is combined with presence of some clouds in the sky and penetrating light through the pockets in those clouds, you can get very dramatic views in the valley. I happened to catch all of these on the day I shot this image. Though I am very happy with how the image turned out I can't forget that seeing this beauty in person was an altogether different experience. I am glad I could bring back some of that in this image. Tech Info: Lens: Canon EF 17-40mm f/4L @ 24mm Camera: Canon EOS 5D Mk II Exposure: 1.6sec at f/14 and ISO 100 Filters: Hoya 8-stop solid ND filter along with LEE 0.9 (3-stop) soft edge ND Grad filter Yosemite is the arguably the most beautiful national park. It's grandeur and the time scale it took to evolve is very humbling. I learnt that the granite peaks started out as molten magma deep below the earth's surface about 100 million years ago. Merced river then carved it into a "V" shaped valley and finally glaciers shaped it into its present day "U" shape. The beauty of the valley has inspired many. It's lush forests, tall granite peaks, amazing monoliths and beautiful waterfalls are so pristine that a visit to the park often overwhelms the senses. A visit here at least once in lifetime is a must. "Upper Yosemite Falls" Location: Swinging Bridge, Yosemite National Park, California. 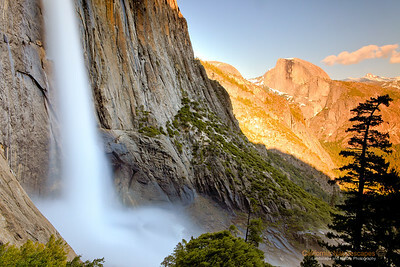 Yosemite falls are some of the word's tallest. 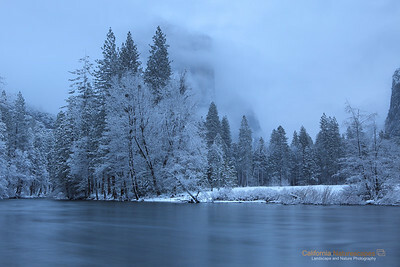 Here you see upper Yosemite falls during early morning hours on a spring day. A snow storm of previous day had ladden the trees with interesting outline which was starting to melt as I shot this image. The merced river flowed gently and I decided to use long exposure to show all the reflections. Tech Info: Lens: Canon EF 24-70mm f/2.8L @ 55mm Camera: Canon EOS 5D Mk II Exposure: 2+min at f/14 and ISO 100 Filters: LEE 10-stop Big Stopper ND Filter and LEE 0.6 (2-stop) soft edge graduated neutral density filter Yosemite is the arguably the most beautiful national park. It's grandeur and the time scale it took to evolve is very humbling. I learnt that the granite peaks started out as molten magma deep below the earth's surface about 100 million years ago. Merced river then carved it into a "V" shaped valley and finally glaciers shaped it into its present day "U" shape. The beauty of the valley has inspired many. It's lush forests, tall granite peaks, amazing monoliths and beautiful waterfalls are so pristine that a visit to the park often overwhelms the senses. A visit here at least once in lifetime is a must. 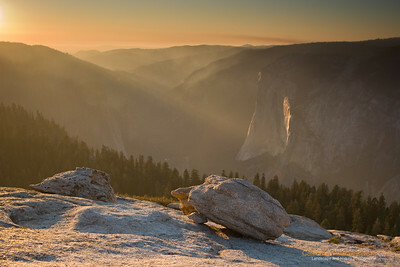 "Magic Hour at Valley View" Location: Yosemite National Park, California. The storm had passed but the fog lingered on El Capitan. As the sunset drew closer the valley was filled with warm glow reflecting off El Cap and merced river. Tech Info: Lens: Canon EF 17-40mm f/4L @ 40mm Camera: Canon EOS 5D Mk II Exposure: 2.5sec at f/18 and ISO 50 Filters: Singh Ray 3 stop rev. ND Grad, LEE .9 soft edge ND Grad and B+W Circular polarizer Note: On a day like this make sure to be at this spot an hour or two before sunset. When I arrived here there was still room to find good composition and settle on a spot. Soom many other photographers arrived in frenzy and it was bit of a chaos seeing everyone trying to find a good spot to shoot the drama unfolding at sunset. Yosemite is the arguably the most beautiful national park. It's grandeur and the time scale it took to evolve is very humbling. I learnt that the granite peaks started out as molten magma deep below the earth's surface about 100 million years ago. Merced river then carved it into a "V" shaped valley and finally glaciers shaped it into its present day "U" shape. The beauty of the valley has inspired many. It's lush forests, tall granite peaks, amazing monoliths and beautiful waterfalls are so pristine that a visit to the park often overwhelms the senses. A visit here at least once in lifetime is a must. 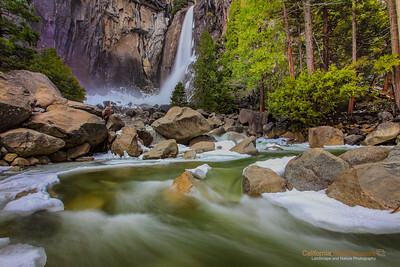 "Upper Yosemite Falls - Spring Flow" Location: Upper Yosemite Falls Trail, Yosemite National Park, California. Spring in Yosemite is the best time to experience waterfalls. This year, in particular, the waterfalls are roaring and I did not want to miss an opportunity to capture some of the action. This view of the upper Yosemite falls can only be seen halfway through the hike on the tail that goes all the way up to the top of the falls. Even though I liked this image very much I have to say that there is nothing like hiking on this trail in person and enjoying the thundering roar of the waterfall and getting sprayed on by the mist. Also needless to say the view of the falls from the ledge on the top offers a unique perspective on how tall these falls are. After hiking all the way up I realized that the best unobstructed views of the falls were from a spot which was about halfway through the hike. The evening light offered interesting orange colors on the rock face and deep blues in the sky are typical for this time of the year. This is a long exposure image since I wanted to soften the flow of the water and highlight on the sheer vertical length of the falls. I highly recommend hiking on this trail especially in spring and if you start your hike at noon you enjoy the sunset views on your way back. Tech Info: Lens: Canon EF 24-70mm f/2.8 @ 27mm Camera: Canon EOS 5D Mk II Exposure: 20sec at f/16 and ISO 50 Filters: Hoya 8 stop solid ND filter to cut light and allow long exposure. LEE 0.9 (3-stop) soft edge ND Grad filter stacked with another LEE 0.75 hard edge ND Grad filter to balance exposure of the sky with the rock. Yosemite is the arguably the most beautiful national park. It's grandeur and the time scale it took to evolve is very humbling. I learnt that the granite peaks started out as molten magma deep below the earth's surface about 100 million years ago. Merced river then carved it into a "V" shaped valley and finally glaciers shaped it into its present day "U" shape. The beauty of the valley has inspired many. It's lush forests, tall granite peaks, amazing monoliths and beautiful waterfalls are so pristine that a visit to the park often overwhelms the senses. A visit here at least once in lifetime is a must. 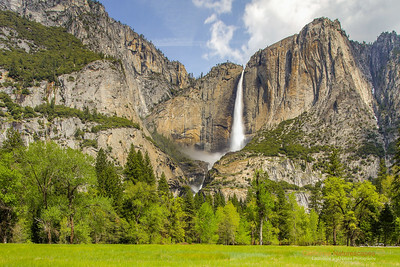 "Yosemite Falls in Spring" Location: Yosemite National Park, California. Spring in Yosemite is beautiful. The waterfalls are at their peak flow, greenary is all around, temperatures are very comfortable and little ponds in the meadows add to the scenary. Tech Info: Lens: Canon EF 17-40mm f/4L @ 23mm Camera: Canon EOS 5D Mk II Exposure: 2sec at f/16 and ISO 50 Filters: Hoya 8 stop solid ND filter to allow 2sec exposure. LEE 0.9 (3-stop) soft edge ND Grad filter to balance exposure of the sky with foreground. Yosemite is the arguably the most beautiful national park. It's grandeur and the time scale it took to evolve is very humbling. I learnt that the granite peaks started out as molten magma deep below the earth's surface about 100 million years ago. Merced river then carved it into a "V" shaped valley and finally glaciers shaped it into its present day "U" shape. The beauty of the valley has inspired many. It's lush forests, tall granite peaks, amazing monoliths and beautiful waterfalls are so pristine that a visit to the park often overwhelms the senses. A visit here at least once in lifetime is a must. 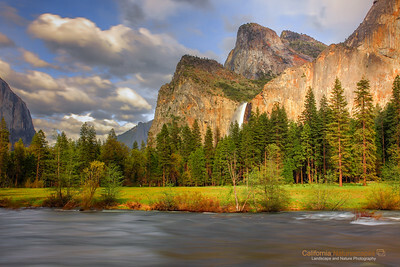 "Evening Light on Bridalveil Falls" Location: Yosemite National Park, California. 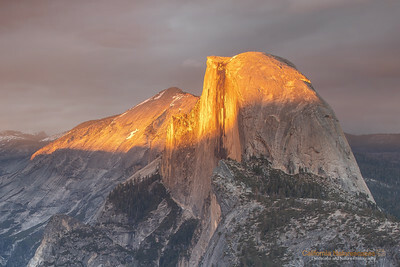 Mid May light of late afternoon falls directly on the walls of Yosemite illuminating them in warm hues. Tech Info: Lens: Canon EF 70-200 f/4L IS @200mm Camera: Canon EOS 5D Mk II Exposure: 1.3sec at f/16 and ISO 200 Filters: Hoya 8-stop solid ND filter to cut light and allow long exposure This is a stich from five horizontal shots to obtain even exposure during changing lighting conditions. Yosemite is the arguably the most beautiful national park. It's grandeur and the time scale it took to evolve is very humbling. I learnt that the granite peaks started out as molten magma deep below the earth's surface about 100 million years ago. 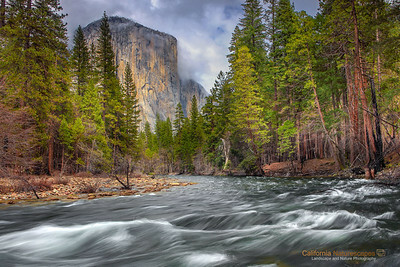 Merced river then carved it into a "V" shaped valley and finally glaciers shaped it into its present day "U" shape. The beauty of the valley has inspired many. It's lush forests, tall granite peaks, amazing monoliths and beautiful waterfalls are so pristine that a visit to the park often overwhelms the senses. A visit here at least once in lifetime is a must. 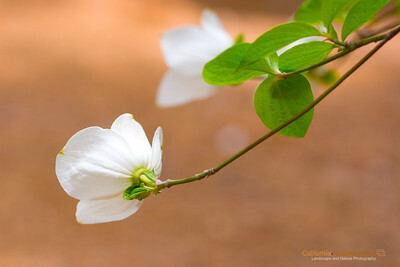 "Pacific Dogwoods" Location: Yosemite National Park, California. Pacific dogwoods are unique flowers which bloom once a year in a spectacular displace at Yosemite National Park. It is always fun a challenge to capture the display when leaves are still young and flowers are at their best. The bloom of these flowers is truly an ephemeral event. They bloom at the start of the summer season during mid to late May time-frame and are photographically at their best for maybe two weeks. Tech Info: Camera: Canon EOS 30D Lens: Canon EF 70-200 f/4L IS @ 70mm Exposure: 1/800sec at f/4 and ISO 320 Filters: No filters Yosemite is the arguably the most beautiful national park. It's grandeur and the time scale it took to evolve is very humbling. I learnt that the granite peaks started out as molten magma deep below the earth's surface about 100 million years ago. Merced river then carved it into a "V" shaped valley and finally glaciers shaped it into its present day "U" shape. The beauty of the valley has inspired many. It's lush forests, tall granite peaks, amazing monoliths and beautiful waterfalls are so pristine that a visit to the park often overwhelms the senses. A visit here at least once in lifetime is a must. Location: Central Valley of California aka San Joaquin Valley. Here is a view of Almond orchards from the Central Valley of California. This part of California is one of the most fertile areas in the world producing large quantities of almonds, peaches, nectarines and other fruits and nuts which get supplied all over the world. I drive through Central Valley on my way to Yosemite and find the views very appealing. the arrangement and sheer expanse of these orchards is something to see in person. 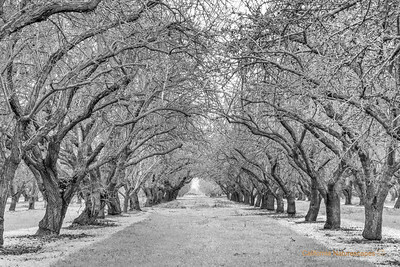 Weather it's winter, which is when I shot this image, or spring the views of these orchards is phenomenal. Tech Info: Lens: Canon EF 70-200 f/4L IS @ 121mm Camera: Canon EOS 5D Mk II Exposure: 1/4sec at f/22 and ISO 200 Filters: No filters Post Processing: White balance and green hue/saturation adjustment Yosemite is the arguably the most beautiful national park. It's grandeur and the time scale it took to evolve is very humbling. I learnt that the granite peaks started out as molten magma deep below the earth's surface about 100 million years ago. Merced river then carved it into a "V" shaped valley and finally glaciers shaped it into its present day "U" shape. The beauty of the valley has inspired many. It's lush forests, tall granite peaks, amazing monoliths and beautiful waterfalls are so pristine that a visit to the park often overwhelms the senses. A visit here at least once in lifetime is a must. "Giant Cathedral Rocks" Location: Yosemite National Park, California. One of the experiences of Yosemite National Park that I like to capture is how it feel to stand in awe of these giant granite peaks rising abruptly and almost vertically from the ground. 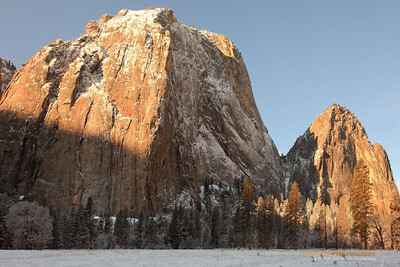 These are giant cathedral rocks in the morning light after a light dusting of snow the previous night. Tech Info: Lens: Canon EF 17-40mm f/4L @ 25mm Camera: Canon EOS 5D Mk II Exposure: 0.3sec at f/16 and ISO 50 Filters: LEE 0.9 (3-stop) soft edge graduated ND filter and LEE .75 hard edge upside down to control overexposure of the snow on the foreground. Post Processing: The most important step in this image was the lens distortion correction using PhotoShop CS4. Without this correction the peaks won't appear vertical enough. Yosemite is the arguably the most beautiful national park. It's grandeur and the time scale it took to evolve is very humbling. I learnt that the granite peaks started out as molten magma deep below the earth's surface about 100 million years ago. Merced river then carved it into a "V" shaped valley and finally glaciers shaped it into its present day "U" shape. The beauty of the valley has inspired many. It's lush forests, tall granite peaks, amazing monoliths and beautiful waterfalls are so pristine that a visit to the park often overwhelms the senses. A visit here at least once in lifetime is a must. 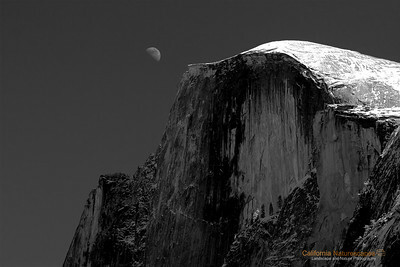 "Half Dome - Half Moon" Location: Yosemite National Park, California. The beauty and grandeur of Yosemite was best photographed by late Ansel Adams. This is tribute to his work. The Half Dome is the iconic rock of Yosemite and is a very popular hiking destination in the valley. Apparently half of it was sheared off by glaciers giving it its name. Tech Info and Tip: Lens: Canon EF 70-200 f/4L IS at 100mm Camera: Canon EOS 30D Exposure: 1/125sec at f/5.0 and ISO 100 Filters: No filters Using red filter while converting to b&w can have interesting effects in the sky. A red filter typically darkens the sky which I like for images like this. Yosemite is the arguably the most beautiful national park. It's grandeur and the time scale it took to evolve is very humbling. I learnt that the granite peaks started out as molten magma deep below the earth's surface about 100 million years ago. Merced river then carved it into a "V" shaped valley and finally glaciers shaped it into its present day "U" shape. The beauty of the valley has inspired many. It's lush forests, tall granite peaks, amazing monoliths and beautiful waterfalls are so pristine that a visit to the park often overwhelms the senses. A visit here at least once in lifetime is a must. "snow Covered Half Dome" Location: Yosemite National Park, California. Certain conditions in Yosemite last for a very short duration. 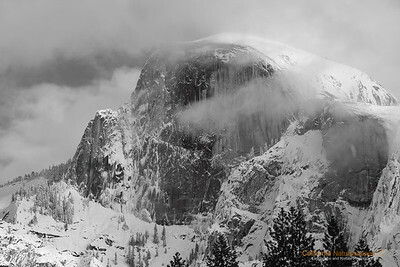 A snow covered and fog shrouded view of iconic Half-Dome is not rare but difficult to catch since the snow melts quite rapidly. 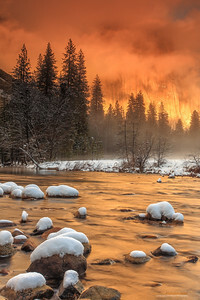 I was fortunate to visit Yosemite immeidately after a heavy snowstorm and was happy to catch this view. Tech Info: Lens: Canon EF 70-200 f/4L IS @ 121mm Camera: Canon EOS 5D Mk II Exposure: 1/125sec at f/9 and ISO 200 Filters: B+W Circular Polarizer Yosemite is the arguably the most beautiful national park. It's grandeur and the time scale it took to evolve is very humbling. I learnt that the granite peaks started out as molten magma deep below the earth's surface about 100 million years ago. Merced river then carved it into a "V" shaped valley and finally glaciers shaped it into its present day "U" shape. The beauty of the valley has inspired many. It's lush forests, tall granite peaks, amazing monoliths and beautiful waterfalls are so pristine that a visit to the park often overwhelms the senses. A visit here at least once in lifetime is a must. 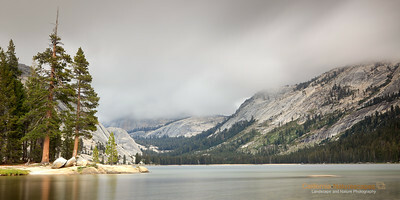 "Tenaya Lake" Location: Yosemite National Park, California. Situated high up in sierra mountains Tenaya lake is one of the pristine lakes that is easily accessible during a visit to Yosemite national park. The landscape here is dominated by giant granite domes that were once covered in ancient glaciers. The lake is the remaining legacy of those glaciers. I liked bit of light showing up on the pine trees and decided to include those in the composition as well. Tech Info: Lens: Canon EF 24-70mm f/2.8 @ 50mm Camera: Canon EOS 5D Mk II Exposure: 25sec at f/16 and ISO 50 Filters: LEE ND Grads 0.9 and 0.6 soft edge Yosemite is the arguably the most beautiful national park. It's grandeur and the time scale it took to evolve is very humbling. I learnt that the granite peaks started out as molten magma deep below the earth's surface about 100 million years ago. Merced river then carved it into a "V" shaped valley and finally glaciers shaped it into its present day "U" shape. The beauty of the valley has inspired many. It's lush forests, tall granite peaks, amazing monoliths and beautiful waterfalls are so pristine that a visit to the park often overwhelms the senses. A visit here at least once in lifetime is a must. 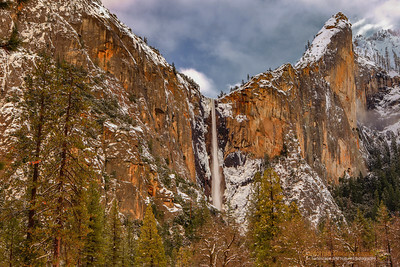 "Bridalveil Falls in Winter" Location: Yosemite National Park, California. 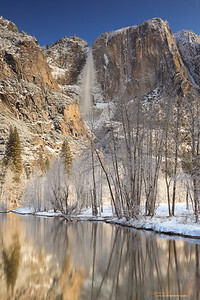 A bright day after a fresh dusting of snow in Yosemite is a wonderful condition to photograph Yosemite. This spot gets good light during summer when the sun hits directly on the cliff face at sunset. But a combination of clouds and ambient light during winter can be equally appealing. I felt the light on this cliff face was very pleasing on this day and decided to capture this moment. Tech Info: Lens: Canon EF 24-70mm f/2.8L @ 46mm Camera: Canon EOS 5D Mk II Exposure: 0.3sec at f/16 and ISO 50 Filters: B+W Circular Polarizer Yosemite is the arguably the most beautiful national park. It's grandeur and the time scale it took to evolve is very humbling. I learnt that the granite peaks started out as molten magma deep below the earth's surface about 100 million years ago. Merced river then carved it into a "V" shaped valley and finally glaciers shaped it into its present day "U" shape. The beauty of the valley has inspired many. It's lush forests, tall granite peaks, amazing monoliths and beautiful waterfalls are so pristine that a visit to the park often overwhelms the senses. A visit here at least once in lifetime is a must. 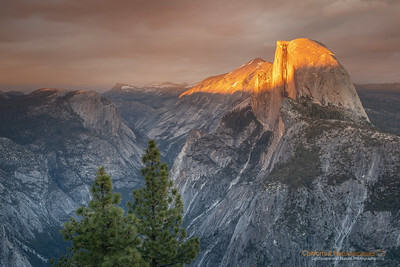 "Sentinel Dome Sunset" Location: Yosemite National Park, California. I am posting this image from Yosemite that I captured back in 2007. I have not been to Yosemite for a while now and I am starting to get an itch to pay another visit soon. In the mean time I was going through images from the past and came across this image. Looking at it now I really like it. The warmth of sunlight glow on the glacial erractic boulder brings back the memory of the hike we did on that Nov. evening. So here it is. Tech Info: Camera: Canon EOS 30D Lens: Canon EF 24-70 f/2.8L @ 28mm Exposure: 1/200sec at f/2.8 and ISO 100 Filters: 2 Stop Singh Ray ND Grad filter Yosemite is the arguably the most beautiful national park. It's grandeur and the time scale it took to evolve is very humbling. I learnt that the granite peaks started out as molten magma deep below the earth's surface about 100 million years ago. Merced river then carved it into a "V" shaped valley and finally glaciers shaped it into its present day "U" shape. The beauty of the valley has inspired many. It's lush forests, tall granite peaks, amazing monoliths and beautiful waterfalls are so pristine that a visit to the park often overwhelms the senses. A visit here at least once in lifetime is a must. 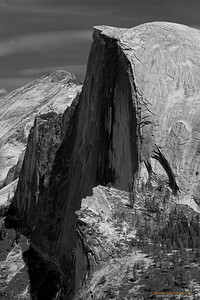 "Half Dome" Location: Glacier Point, Yosemite National Park, California. Glacier Point has the best vantage point for Half Done in my opinion. Well, of course, there is nothing that compares to actually hiking up the Half Dome, but it's grandeur is impressive no matter from where you look at it. It is such an iconic rock that it is a symbol of Yosemite National Park. The solid monolith was sheared in half by the massive glaciers that once filled the valley, hence the name Half Dome. Tech Info and Tip: Lens: Canon EF 70-200 f/4L IS @127mm Camera: Canon EOS 30D Exposure: 1/320sec at f/4 and ISO 100 Yosemite is the arguably the most beautiful national park. It's grandeur and the time scale it took to evolve is very humbling. I learnt that the granite peaks started out as molten magma deep below the earth's surface about 100 million years ago. Merced river then carved it into a "V" shaped valley and finally glaciers shaped it into its present day "U" shape. The beauty of the valley has inspired many. It's lush forests, tall granite peaks, amazing monoliths and beautiful waterfalls are so pristine that a visit to the park often overwhelms the senses. A visit here at least once in lifetime is a must. "Yosemite Spring" Location: Tioga Pass, Yosemite, California. 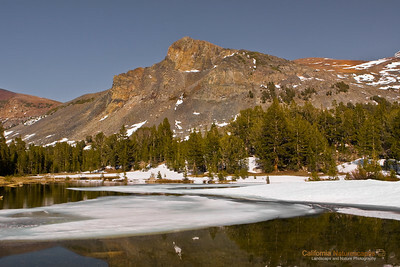 Tioga Pass is one of the high altitude roads through Yosemite and is closed for most part of the year due to snow. During spring there is small window in which the road is open and the surrounding area is covered in snow. Back in 2007 I was lucky to be able to visit this place during this narrow window in time. The melting of the snow creates small pools of water like this one which quickly dry out when the summer kicks in. Tech Info: Lens: Canon EF 24mm f/2.8 @ 24mm Camera: Canon EOS 30D Exposure: 1/80sec at f/9 and ISO 100 Filters: No filters Yosemite is the arguably the most beautiful national park. It's grandeur and the time scale it took to evolve is very humbling. I learnt that the granite peaks started out as molten magma deep below the earth's surface about 100 million years ago. Merced river then carved it into a "V" shaped valley and finally glaciers shaped it into its present day "U" shape. The beauty of the valley has inspired many. It's lush forests, tall granite peaks, amazing monoliths and beautiful waterfalls are so pristine that a visit to the park often overwhelms the senses. A visit here at least once in lifetime is a must. Location: Valley View, Yosemite National Park, California. Yosemite is arguably the most beautiful national park in the world. I feel very privileged that I stay close to Yosemite and can visit it anytime with a couple of hours drive. The proximity to the park has allowed me to visit it practically in every season. 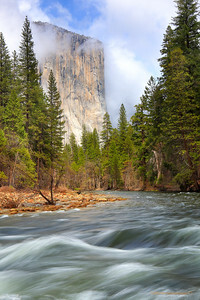 The view captured here is during spring season when the water in the Merced river is high and rapids are in full force. Spring is also the season of waterfalls and you can see that the Bridalveil falls on the right and Ribbontail falls on the left are also flowing at their peak. The waterfalls reach their peak flow due of all the snowmelt at higher elevation. 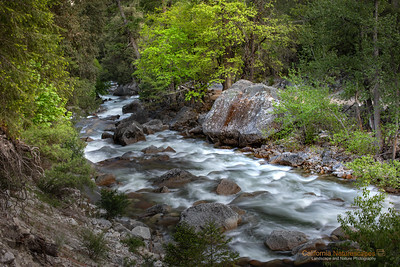 The beauty in the valley does not end with flows in Merced river and waterfalls alone. The meadows start turning green and bring out a lush green color in the park that is in very good contrast with the warm tones of the granite peaks during evening hours. And when all of this is combined with presence of some clouds in the sky and penetrating light through the pockets in those clouds, you can get very dramatic views in the valley. I happened to catch all of these on the day I shot this image. Though I am very happy with how the image turned out I can't forget that seeing this beauty in person was an altogether different experience. I am glad I could bring back some of that in this image. Yosemite is the arguably the most beautiful national park. It's grandeur and the time scale it took to evolve is very humbling. I learnt that the granite peaks started out as molten magma deep below the earth's surface about 100 million years ago. Merced river then carved it into a "V" shaped valley and finally glaciers shaped it into its present day "U" shape. The beauty of the valley has inspired many. It's lush forests, tall granite peaks, amazing monoliths and beautiful waterfalls are so pristine that a visit to the park often overwhelms the senses. A visit here at least once in lifetime is a must.